Please select an option No.1 No.2 No.3 No.4 No.5 No.6 No.7 No.8 No.9 No.10 No.11 No.12 No.13 No.14 Please select a Color. When comfort is what you’re all about, this top blouse has exactly what you’re looking for. The feeling of this light and soft fabric against your skin will feel amazing enough to make you want to wear it every opportunity you have. Available in 14 different colors, you will have a fun time choosing which is right for you. The v-neckline meets in the center with a quarter-length zipper accent. The sleeves are three-quarter length and feature a button and sash strap that adds a little extra air flow. 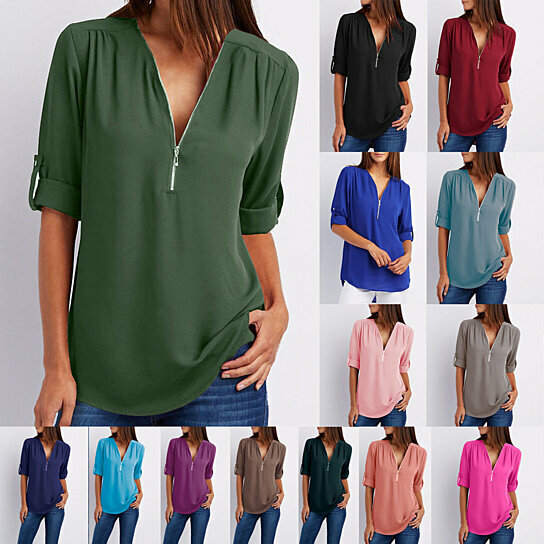 The loose fitting shirt provides you with a versatile top you will enjoy wearing to different places and with different outfits. Color: 14 Assorted Color For your choice. Please review the size chart in last photo for best fit or choose one size up than your usual.